Word is getting out there about our new Prescribe Vegetarian Campaign. This week we focused on promoting the campaign to Bastyr University’s College of Naturopathic Medicine. Here you can see us talking to people about it at their Herb and Food Fair. We were happy to see so much interest not only from Naturopathic physicians but also from traditional MDs. On display was the letter we sent to the president of Bastyr asking the University to alter its curriculum to include specific courses in vegetarian nutritional medicine. See the letter in full below. We are writing to ask you to include the science of vegetarian nutritional medicine in the didactic portion of Bastyr’s naturopathic medical training, and its practice as a therapeutic in the clinical portion of your medical school education. Indeed, vegetarian nutritional medicine seems right in line with the six principles of naturopathic medicine your University has, in that it is completely in line with the first do no harm dictum, has extraordinary preventive potential, most directly treats the cause of most diseases afflicting American society and may be the most powerful example of the healing power of nature there is. Diet is the number one leading risk factor for disease burden in the United States[i] yet doesn’t have a large presence in most medical curricula. We recognize that Bastyr does teach some nutrition education, but what needs to be taught is the application of various plant-based diets in the prevention and treatment of disease. Each type of plant-based diet should be individually prescribed for the patient in question, and integrated with any other naturopathic treatments that the patient may be receiving. A substantial number of high quality medical studies, published in major medical journals, now demonstrate that a healthy vegetarian diet, composed of vegetables, legumes, whole grains, fruit plus nuts and seeds, is very effective preventative medicine for most cases of the common diseases affecting many Americans, such as coronary artery disease, essential hypertension, certain forms of cancer such as prostate cancer, obesity, and type II diabetes, as well as several less common diseases. It also is often the safest and most efficacious treatment for most cases of those diseases. In many other circumstances it serves as a valuable adjunct to medication or surgery. Vegetarian nutritional medicine has broad applicability and acceptance among a wide variety of patients. For instance, a study conducted in a rural area provided evidence that a vegetarian diet lowers the risk for many diseases and is an effective treatment for the common chronic diseases in this population[ii]. In addition to the benefit to individual patients, there are significant benefits to public health and to society at large when doctors are able to treat patients by prescribing a healthy vegetarian diet. In particular, the problem of antibiotic-resistant bacteria would be much reduced if doctors prescribed a healthy vegetarian diet to many of their patients. As we’re sure you know, most antibiotic-resistant bacteria result from the non-therapeutic use of antibiotics on farm animals, kept in very crowded conditions on so-called factory farms, in order to allow them to survive such harsh conditions and grow to commercial weights. [iii] It is not possible to provide the quantity of meat currently demanded by customers in this country, without using antibiotics on such farms. If the demand for meat and other animal products were to be significantly reduced, there would be less need for factory farms, and so the use of antibiotics on farms would also be reduced, and hence the development of antibiotic-resistant bacteria. Very little of this is currently being taught at Bastyr University and hence it is not being put into clinical practice. This lack of education disempowers naturopathic doctors from offering the best preventative and therapeutic measures to their patients, and deprives their patients from effective therapies resulting in unnecessary morbidity and mortality, while greatly increasing healthcare costs for both their patients and the entire nation. A growing number of patients are not waiting for their doctors to learn about the role of vegetarian nutritional medicine for the prevention and treatment of disease, and so they treat themselves using information from the internet and other potentially unreliable sources, without the knowledge and experience that one would expect their physician to have. [v] In our experience, they would much rather be able to include their physicians on their healthcare team, but they feel they can’t because their doctors have so little knowledge in nutritional medicine. The Science: Students need to know basic nutritional science: how different nutrients and foods function in both normal and various disease states in the human body. Best Practice: They need to know how to prescribe appropriate nutritional treatments either as a monotherapy or as an adjunct for each patient. Effective Delivery: They need to know how to guide patients through their dietary changes. In fact, many doctors have already started to practice vegetarian nutritional medicine and integrate it into their patients’ treatments. [vi] Even the new president of the American College of Cardiology, Dr. Ken Williams, uses this modality of treatment for his patients. We are not advocating vegetarian nutritional medicine as a panacea for all ills – there is certainly an important role for appropriate medication, surgery and various naturopathic treatments such as herbal medicine. However, we believe that vegetarian nutritional medicine must be given a prominent position in the curriculum, so that doctors will be empowered to use it as a tool for clinical practice and as a background for research. We recognize that there are always going to be some costs involved in changing the curriculum, but our proposal only requires new materials for the specific vegetarian nutrition science course, plus one or two clinicians practicing lifestyle medicine for the rotations. These costs will be minimal in comparison to the long term benefit to the public and patients. We are willing to help in the educational process. 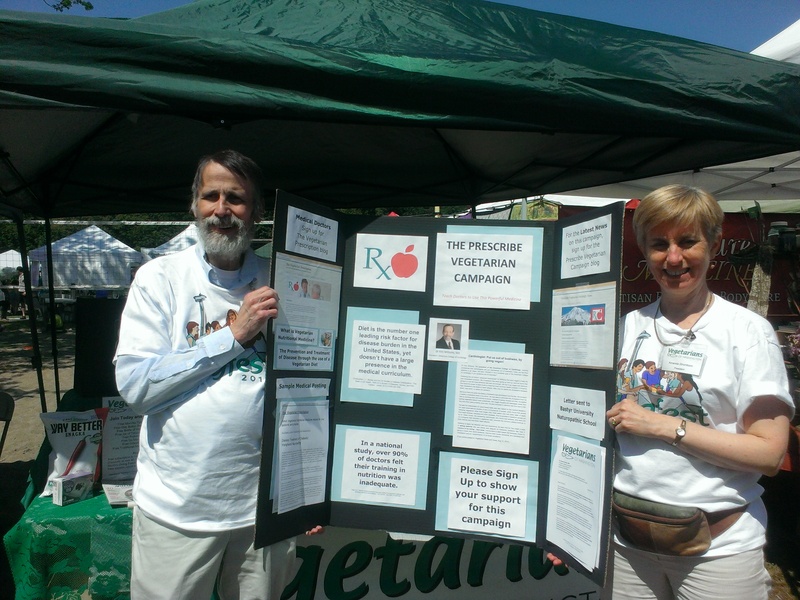 We would be happy to provide a brief introduction to vegetarian nutritional medicine free of charge to your students. We have already given this to a group of your students at Bastyr last year, and at Western University Medical School in Lebanon, OR, with great success. While we are not able to offer the comprehensive vegetarian nutritional medicine education that your students really need, it does provide a good beginning and gives your current students a running start in a subject which is critical to their future practice of medicine. We would appreciate the opportunity to meet with you and answer any questions you may have. Thank you for your attention to this matter. Health is important to every citizen of this state and the public is counting on you. Please feel free to contact us if we can be of any help to the students or medical school. Rep. Mia Greggerson, WA State Representative for 33rd district, Higher Education committee. [ii] David Drozek et al. “Short-term effectiveness of a lifestyle intervention program for reducing selected chronic disease risk factors in individuals living in rural Appalachia: a pilot cohort study.” Adv Prev Med. EPub Jan 16 2014; 2014:798184. [iii] Steve Heilig et al. “Curtailing antibiotic use in agriculture. It is time for action: this use contributes to bacterial resistance in humans.” West J Med. 2002 Jan; 176(1): 9–11. [iv] Dr. Dean Ornish’s Program for Reversing Heart Disease. Published 2010 by Random House Publishing Group. This entry was posted in Uncategorized and tagged Bastyr, vegetarian nutrition, vegetarian nutritional medicine. Bookmark the permalink. ← Protein Combining – Is it necessary?